For LEDs in the visible spectrum, the nominal wavelength indicates the wavelength at which the LED appears brightest to the human eye. The nominal wavelength for visible LEDs may not correspond to the peak wavelength as measured by a spectrometer. The MBB1L3 LED may not turn off completely when modulated at frequencies above 1 kHz with a duty cycle of 50%, as the broadband emission is produced by optically stimulating emission from phosphor. For modulation at frequencies above 1 kHz, the duty cycle may be reduced. For example, 10 kHz modulation is attainable with a duty cycle of 5%. Each uncollimated, mounted LED consists of a single LED that has been mounted to the end of a heat sink. Most of the LEDs on this page have a heat sink housing that has the same 1.20" external diameter as an SM1 lens tube. Some of the LEDs offered below generate more heat during operation, and so are mounted to a larger heat sink with a Ø57.0 mm plastic housing for increased heat dissipation and thermal stability (indicated by the green rows in the table to the right). All the heat sinks are equipped with 6 mm deep internal SM1 (1.035"-40) threads for easy integration with other Thorlabs components. The larger heat sinks are also equipped with four 4-40 tapped holes for compatibility with 30 mm cage systems. The integrated EEPROM chip in each LED stores information about the LED (e.g., current limit, wavelength, and forward voltage) and can be read by Thorlabs' DC2200 and DC4100 LED Controllers. For more information about LED drivers, including the basic LEDD1B driver, see the LED Drivers tab. 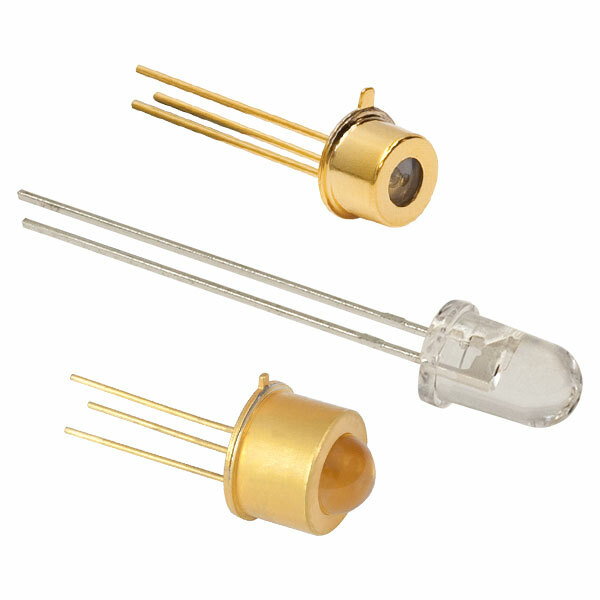 These mounted LEDs possess good thermal stability properties, eliminating the issue of degradation of optical output power due to increased LED temperature. For more details, please see the Stability tab. 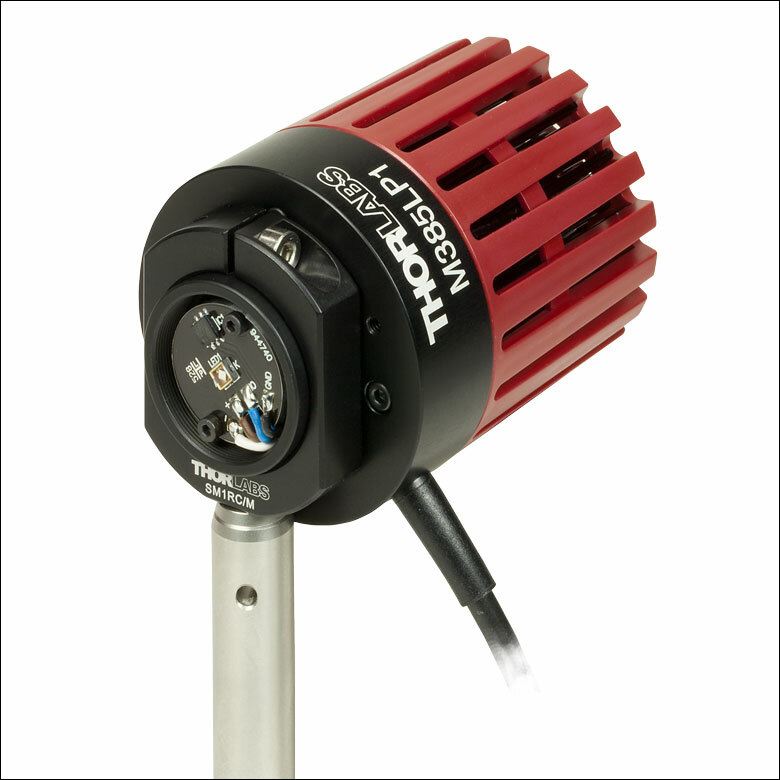 For horticultural applications requiring illumination in both red and blue portions of the spectrum, Thorlabs offers the MPRP1L4. This purple LED features dual peaks at 455 nm and 640 nm, respectively, to stimulate photosynthesis (see graph to compare the absorption peaks of photosynthesis pigments with the LED spectrum). The LED was designed to maintain the red/blue ratio of the emission spectrum over its lifetime to provide high uniformity of plant growth. The MBB1L3 mounted broadband LED has been designed to have relatively flat spectral emission over a wide wavelength range. Its FWHM bandwidth ranges from 500 nm to 780 nm, while the 10 dB bandwidth ranges between 470 nm and 850 nm. For more information on the spectrum of this broadband source, please see the table to the right. 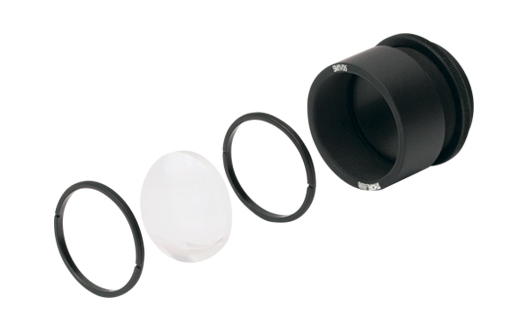 Collimation adapters are available that incorporate an AR-coated aspheric lens for either 350 - 700 nm or 650 - 1050 nm in housings that are compatible with both LED housing styles (Ø57.0 mm or Ø30.5 mm housing). Our adjustable collimation adapters can translate a Ø2" (50 mm) lens by up to 20 mm. A translating carriage, which can be locked using a 2 mm (5/64") hex key or balldriver, is used to provide collimation adjustment. 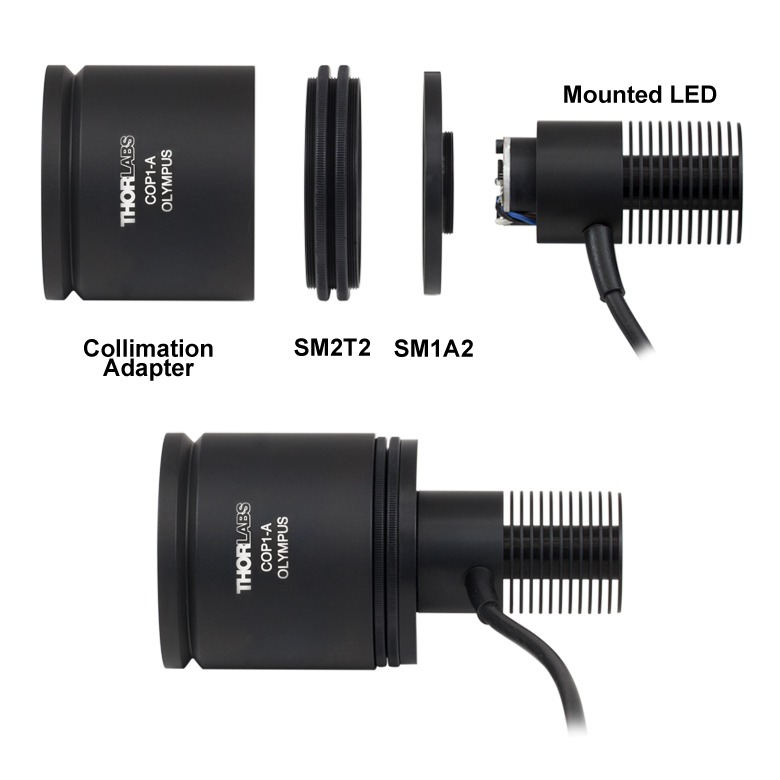 Each adjustable collimation adapter includes an internal SM2 (2.035"-40) thread adapter so that the LEDs can be easily integrated with Thorlabs' SM2-threaded components, such as our microscope port adapters. These adapters are offered in versions with and without an optic. We also offer fixed collimation adapters that mate to the epi-illumination ports on select Leica DMI, Nikon Eclipse Ti, Olympus IX/BX, or Zeiss Axioskop microscopes. See below for more details. 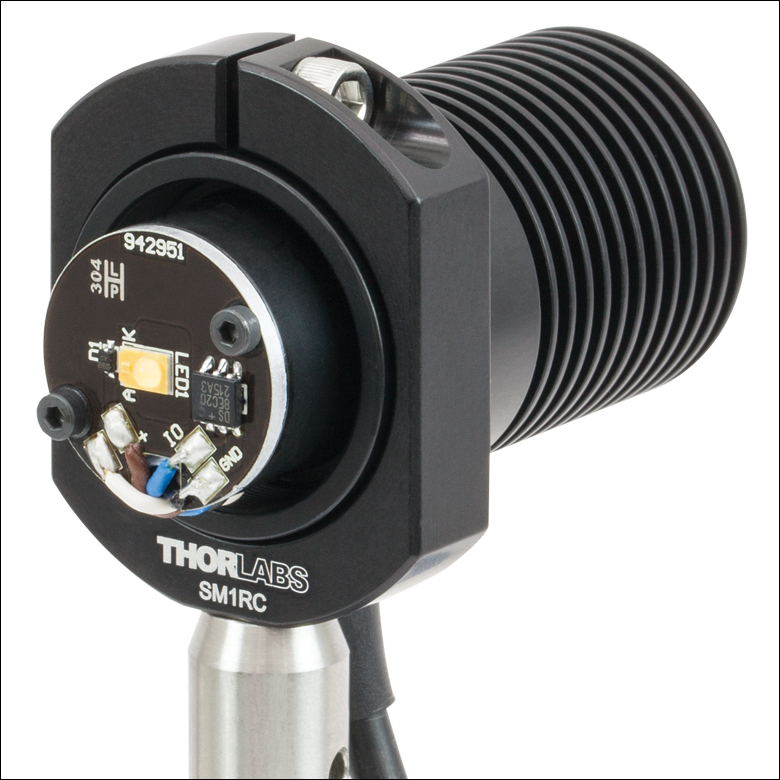 Thorlabs also offers mounted LEDs with pre-attached microscope collimation adapters. 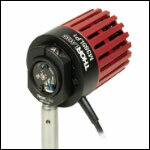 A customizable multi-LED source may be constructed using our mounted LEDs and other Thorlabs items. This source may be configured for integration with Thorlabs' versatile SM1 Lens Tube Systems, 30 mm Cage Systems, and the microscope adapters sold below. Please see the Multi-LED Source tab for a detailed item list and instructions. Thorlabs also offers integrated, user-configurable 4-Wavelength High-Power LED Sources. Thorlabs offers four LED drivers: LEDD1B, DC2200, DC4100, and DC4104 (the latter two require the DC4100-HUB). See the LED Drivers tab for compatibility and driver features. The LEDD1B is capable of providing LED modulation frequencies up to 5 kHz, while DC4100 and DC4104 can modulate the LED at a rate up to 100 kHz. The DC2200 can provide modulation at up to 250 kHz if driven by an external source. In addition, the DC2200, DC4100, and DC4104 drivers are capable of reading the current limit from the EEPROM chip of the connected LED and automatically adjusting the maximum current setting to protect the LED. Please note that the DC4100 and DC4104 can only be used to drive LEDs requiring a forward voltage of 5 V or less. Thorlabs defines the lifetime of our LEDs as B50/L50, meaning that 50% of the LEDs with a given item # will fall below 50% of the initial optical power at the end of the specified lifetime. Please see the Stability tab for more details. The actual spectral output and total output power of any given LED will vary due to variations in the manufacturing process and operating parameters, such as temperature and current. Both a typical and minimum output power are specified to help you select an LED that suits your needs. Each mounted LED will provide at least the minimum specified output power at the maximum current. In order to provide a point of comparison for the relative powers of LEDs with different nominal wavelengths, the spectra in the plots below have been scaled to the minimum output power for each LED. This data is representative, not absolute. An Excel file with normalized and scaled spectra for all of the mounted LEDs can be downloaded here. Our 340 nm mounted LED has a typical lifetime of >3,000 hours. In this case, the unit under test continued to provide more than 90% of its initial power after 45 days. The sample plot to the right shows example data from long-term stability testing over a 45 day period for a 340 nm mounted LED, which had a lifetime of >3,000 hours (~125 days). The small power drop experienced by the LED after it is turned on is typical behavior during the first few minutes of operation. It corresponds to the period of time required for the LED to warm up to the point where it is thermally stable. Please note that this graph represents the performance of a single LED; the performance of individual LEDs will vary within the stated specifcations. The thermal dissipation performance of these mounted LEDs has been optimized for stable power output. 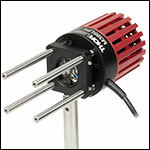 The heat sink is directly mounted to the LED mount so as to provide optimal thermal contact. By doing so, the degradation of optical output power that can be attributed to increased LED junction temperature is minimized (see the graph to the left). The diagram to the right shows the male connector of the mounted LED assembly. 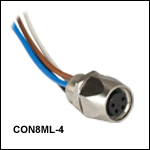 It is a standard M8 x 1 sensor circular connector. Pins 1 and 2 are the connection to the LED. Pin 3 and 4 are used for the internal EEPROM in these LEDs. If using an LED driver that was not purchased from Thorlabs, be careful that the appropriate connections are made to Pin 1 and Pin 2 and that you do not attempt to drive the LED through the EEPROM pins. The DC4100 and DC4104 can power and control up to four LEDs simultaneously when used with the DC4100-HUB. The LEDs on this page all require the DC4100-HUB when used with the DC4100 or DC4104. 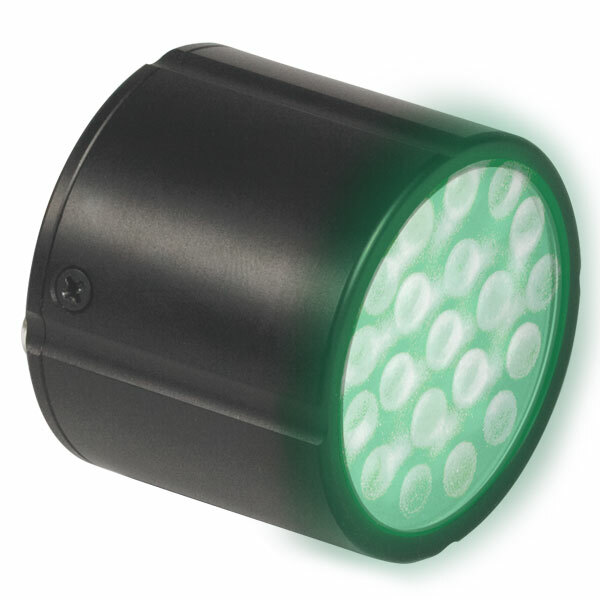 The mounted LEDs sold below are compatible with the LED2 Terminal. Several of these LEDs produce light by stimulating emission from phosphor, which limits their modulation frequencies. The M565L3, M595L3, MPRP1L4, MWWHL4, MNWHL4, and MCWHL5 LEDs may not turn off completely when modulated above 10 kHz at duty cycles below 50%. The MBB1L3 LED may not turn off completely when modulated at frequencies above 1 kHz with a duty cycle of 50%. When the MBB1L3 is modulated at frequencies above 1 kHz, the duty cycle may be reduced; for example, 10 kHz modulation is attainable with a duty cycle of 5%. Thorlabs' extensive catalog of mechanical and optical components provides a variety of configurations that can be used to collimate our mounted LEDs. Some of the applications of the collimated LEDs include custom imaging systems, microscope illuminators, or projectors. Our microscope collimation adapters, available below, feature microscope-compatible outputs and Ø2" aspheric condenser lenses. 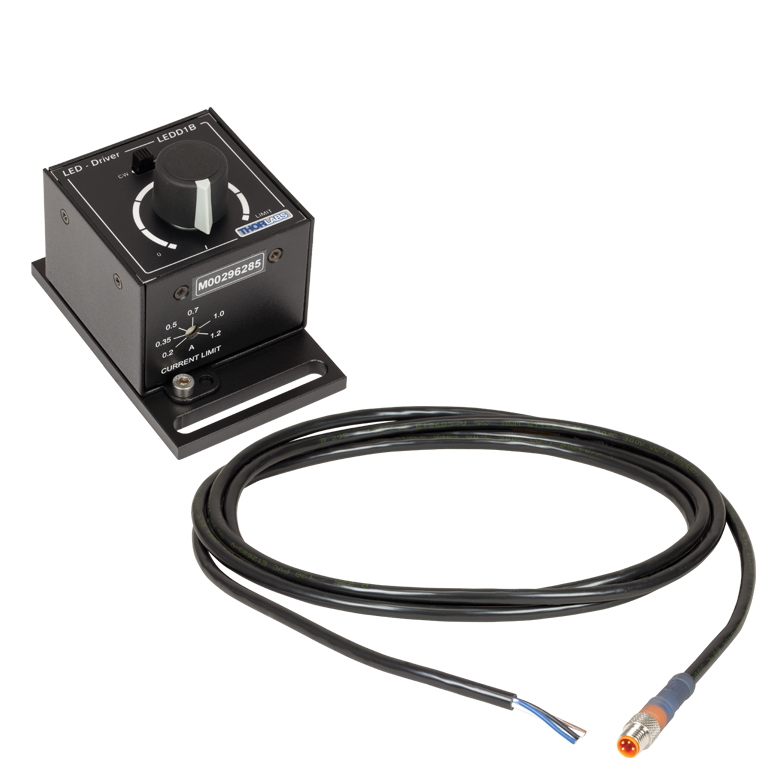 Adjustable collimation adapters, also available below, have external SM1 threading (1.035"-40) and internal SM2 threading (2.035"-40) for integration with standard Thorlabs components. 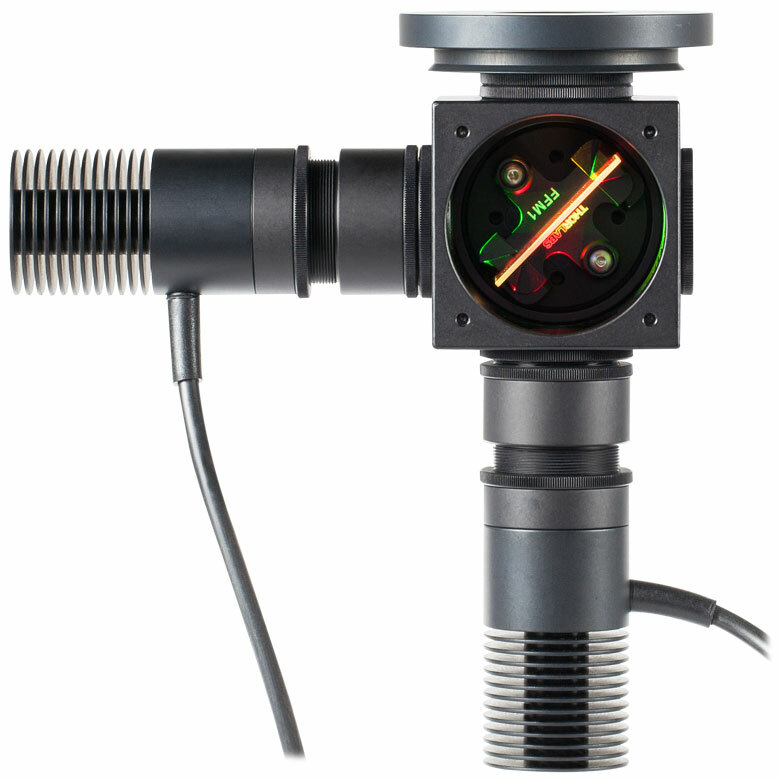 If your setup requires a collimation package with the smallest possible profile, the LEDs can also be integrated with Ø1" collimating optics and SM1-threaded lens tubes. When exchanging the lens in your collimation adapter, please be careful to follow proper optics handling procedures (Optic Handling Tutorial). 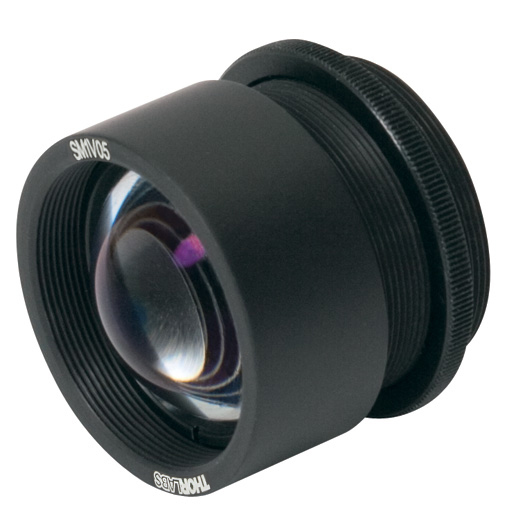 These adapters include a retaining ring that is thicker than our standard retaining ring so that the SPW604 can be used without scratching the highly curved surface of an aspheric condenser lens. -A and -B refer to the type of AR coating on the lens. Thorlabs' LEDs with a nominal wavelength between 365 nm and 660 nm would require the -A coating, while the LEDs with a nominal wavelength between 730 nm and 1050 nm would require the -B Coating. IR LEDs that emit past 1050 nm can be collimated using an uncoated condenser lens, such as the ACL50832U. 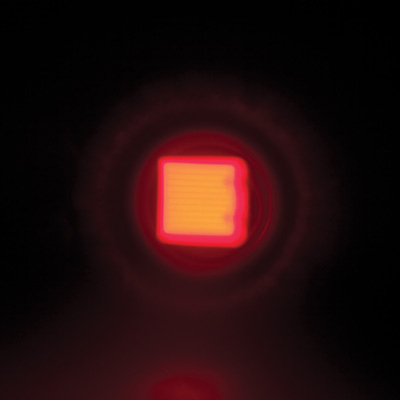 Deep UV LEDs with a wavelength ≤340 nm require a lens fabricated from UV Fused Silica, since many standard varieties of glass do not transmit below 350 nm. 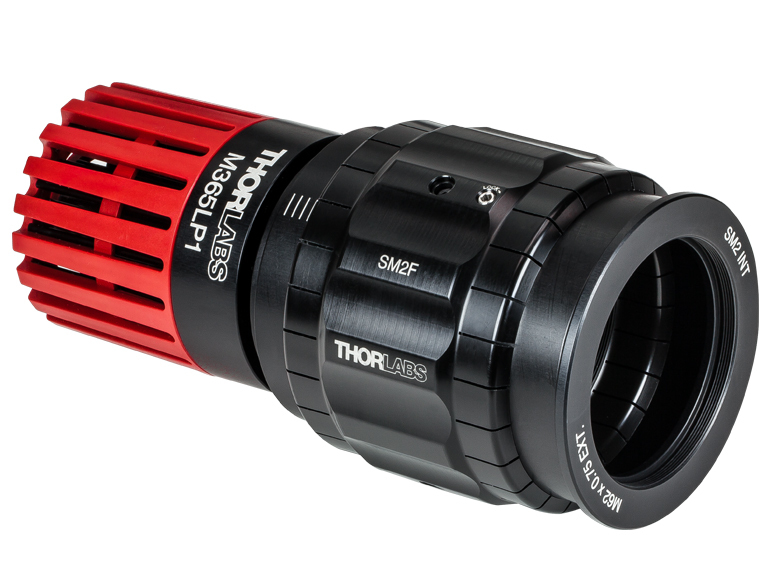 Thorlabs' adjustable collimation adapters accept an Ø2" (Ø50 mm) collimation optic. Adapter Item #'s with a -A or -B suffix include an aspheric condenser lens coated for 350 - 700 nm or 650 - 1050 nm, respectively. 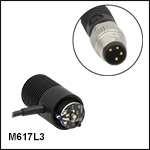 These adapters are also offered without a pre-installed optic so that user-supplied components can be integrated with the LEDs. Several suggestions are presented in the table to the right. Turn the adjustment knob to move the optic mounting carriage to the output end of the housing. Use the SPW604 spanner wrench to remove the retaining ring from the housing. 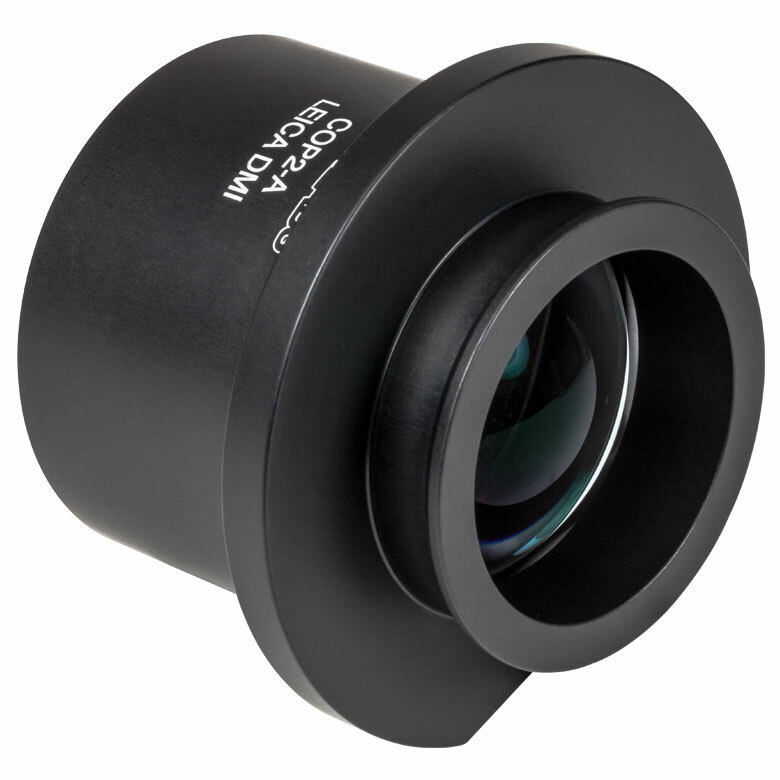 Place a Ø2" (Ø50 mm) optic of your choice into the mounting carriage with the curved surface facing the output. For customers concerned with the homogeneity of the beam, the AR-coated aspheric condenser lens with diffuser is a good option. Use the SPW604 spanner wrench to screw the retaining ring into the mounting carriage, securing the optic in place. Screw the externally SM1-threaded end of the collimation adapter onto an LED of your choice as shown in the picture to the left. 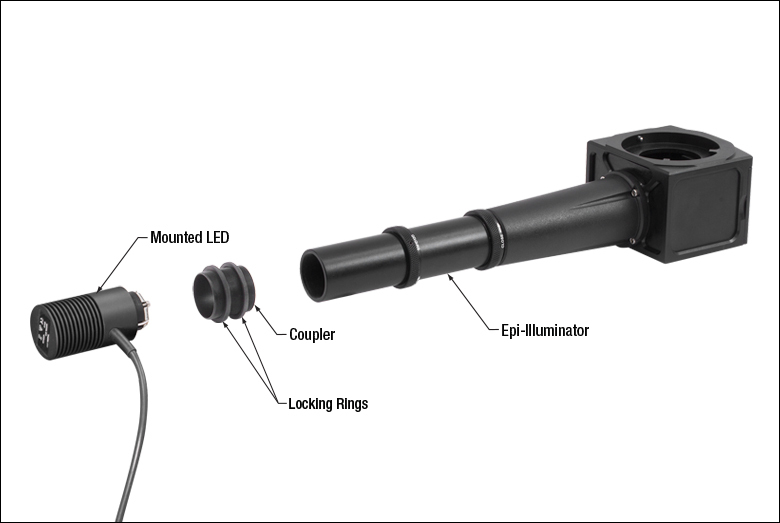 For cases where a smaller profile than the adjustable collimation adapter is required, a simple LED collimation assembly can be built from the components listed in the table to the lower right. While these components are SM1 threaded, we recommend our adjustable spanner wrench due to the steep curvature of the aspheric condenser lens. -A and -B refer to the type of AR coating on the lens. Thorlabs' LEDs with a nominal wavelength between 365 nm and 660 nm would require the -A coating, while the LEDs with a nominal wavelength between 730 nm and 1050 nm would require the -B Coating. 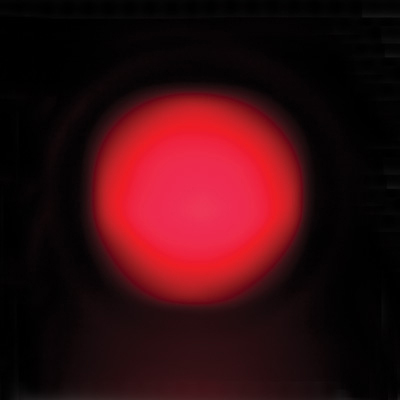 IR LEDs that emit past 1050 nm can be collimated using an uncoated condenser lens, such as the ACL2520U. Deep UV LEDs with a wavelength ≤340 nm require a lens fabricated from UV Fused Silica, since many standard varieties of glass do not transmit below 350 nm. The SM1V10 Adjustable Lens Tube can also be used for this application, however, the translation range of the optic cell will be reduced from 7.6 mm (thread depth of the SM1L03) to 6 mm (thread depth of the LED). 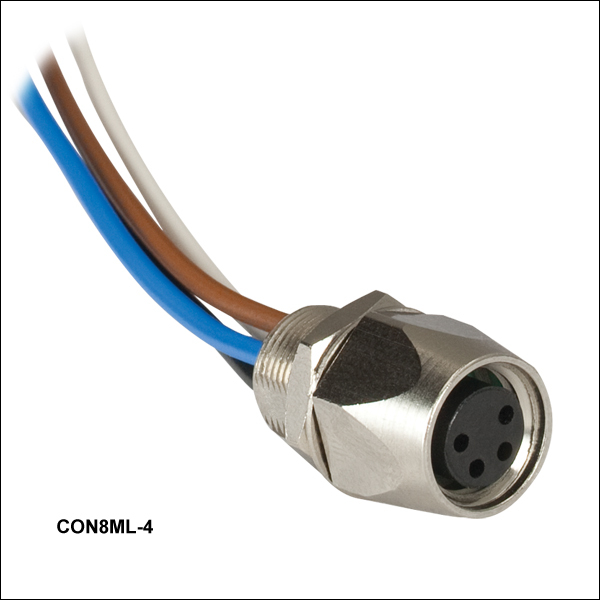 If used, the SM1L03 would no longer be needed in the assembly. ACL2520U-DG6-B) is a good option. By the end of this step, the lens will rest on top of one retaining ring (SM1RR) and be secured in place by another retaining ring placed on top of it. Use the spanner wrench (SPW801) to turn the included retaining ring in the adjustable length lens tube so that it is closer to the inside lip of the tube. Carefully place the lens inside the adjustable length lens tube with the curved side facing away from the male-threaded end of the tube. Secure the lens in place with another retaining ring (SM1RR) using the spanner wrench. Note: Do not use the SPW602 spanner wrench for this step. The thin SM1RR retaining ring does not provide sufficient clearance to tighten it with the SPW602 without scratching the steeply curved surface of an aspheric condenser lens. Thread the male end of the SM1L03 lens tube into the female end of the LED and gently tighten it. Partially thread the male end of the SM1V05 adjustable length lens tube assembly into the female end of the SM1L03-LED assembly. After installing the chosen mounting adapter on a mounted LED, the distance of the lens from the LED should be adjusted by following the steps below. A well-collimated beam has minimal divergence and will not converge at any point in the beam path. Be advised that due to the nature of the output from the LED (high emitter surface area), the beam cannot be perfectly collimated. Please refer to the table below for divergence data. Power on the LED and check to see if it is properly collimated. It is easiest to check that the beam is collimated by noting the changes in the beam diameter over a range of about 1" to 2 feet away; change the distance of the lens from the LED and check again. Do this until the least divergent, non-converging, homogenous beam is obtained. The beam should be somewhat circular in diameter, may have a slightly polygonal shape, and should not be a clear image of the LED itself. If you see an image of the LED, this means that the lens is not close enough to the LED. Move the lens closer to the LED until the image blurs and becomes homogenous – this is the point of collimation. Note: If the lens needs to be closer to the LED when using the SM1V05 assembly, use only one retaining ring to secure the lens in the SM1V05 so that the lens will rest on the inside lip of the SM1V05 adjustable length lens tube. Once the proper collimation position of the lens has been found, lock the position of the lens in place. For the SM1V05 assembly described above, loosen it from the SM1L03 lens tube by about ¼ to ½ turn, rotate the external locking nut until it is flush with the edge of the SM1L03 lens tube, and gently tighten both the assembly and the locking nut by ¼ to ½ turn (there should be slight resistance; do not over tighten). This will lock the collimation position in place. For the adjustable collimation adapters, simply tighten the locking screw using a 2 mm (5/64") hex key. The table below provides examples of how the half viewing angle changes for select LEDs with the addition of a Ø1" aspheric condenser lens. The specifications listed in the table above are nominal values specified by the LED manufacturer. Optimum distance between the respective mounted LED and the ACL2520U lens used to collimate the beam. Power loss to 1/e2 (13.5%). ±1 mm out of focus from Optimum Distance between the respective mounted LED and the ACL2520U lens used to collimate the beam. The divergence data was calculated using Zemax. 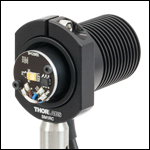 Thorlabs offers the items necessary to create your own custom multi-LED light source using two or three of the mounted LEDs offered below. As configured in the following example, the light source is intended to be used with the illumination port of a microscope. 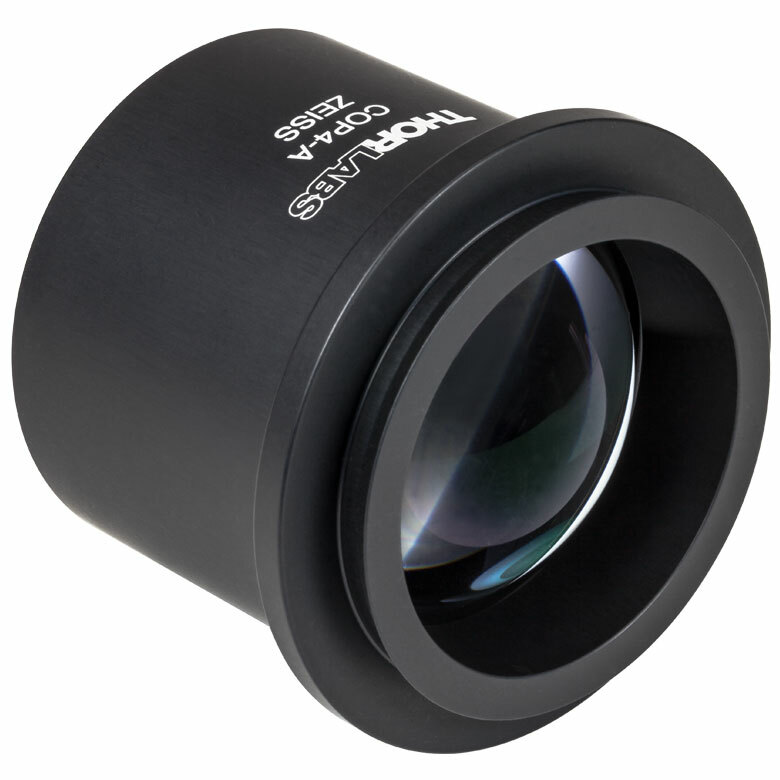 However, it may be integrated with other applications using Thorlabs' versatile SM1 Lens Tube and 30 mm Cage Systems. 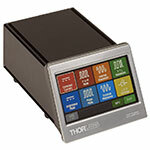 Thorlabs also offers integrated, user-configurable 4-Wavelength LED Sources. First, light will be collimated by lenses mounted in lens tubes. Dichroic mirrors mounted in kinematic cage cubes then combine the output from the multiple LEDs. The mounted LEDs may be driven by LEDD1B Compact T-Cube LED Drivers (power supplies are sold separately). The LEDD1B LED Drivers allow each LED's output to be independently modulated and can provide up to 1200 mA of current. Please take care not to drive the LED sources above their max current ratings. When designing your custom source, select mounted LEDs from below along with dichroic mirror(s) that have cutoff wavelength(s) between the LED wavelengths. The appropriate dichroic mirror(s) will reflect light from side-mounted LEDs and transmit light along the optical axis. Please note that most of these dichroic mirrors are "longpass" filters, meaning they transmit the longer wavelengths and reflect the shorter wavelengths. To superimpose light from three or more LEDs, add each in series (as shown below), starting from the back with longer wavelength LEDs when using longpass filters. Shortpass filters may also used if the longer wavelength is reflected and the shorter wavelength is transmitted. Sample combinations of compatible dichroic mirrors and LEDs are offered in the three tables below. It is also necessary to select an aspheric condenser lens for each source with AR coatings appropriate for the source. Before assembling the light source, collimate the light from each mounted LED as detailed in the Collimation tab. For mounting the aspheric lenses in the SM1V05 Lens Tubes using the included SM1RR retaining rings, we recommend the SPW801 Adjustable Spanner Wrench. A properly collimated LED source should have a resultant beam that is approximately homogenous and not highly divergent at a distance of approximately 2 feet (60 cm). An example of a well-collimated beam is shown on the Collimation tab. After each LED source is collimated, thread the SM1V05 Lens Tubes at the end of each collimated LED assembly into their respective C4W Cage Cube ports using SM1T2 Lens Tube Couplers. Install each dichroic filter in an FFM1 Dichroic Filter Holder, and mount each filter holder onto a B4C Kinematic Cage Cube Platform. Each platform is then installed in the C4W Cage Cubes by partially threading the included screws into the bottom of the cube, and then inserting and rotating the B4C platform into place. Align the platform to the desired position and then firmly tighten the screws. To connect multiple cage cubes and the microscope adapter, use the remaining SM1T2 lens tube couplers along with an SM1L05 0.5" Lens Tube between adjacent cage cubes. Finally, adjust the rotation, tip, and tilt of each B4C platform to align the reflected and transmitted beams so they overlap as closely as possible. If desired, a multi-LED source may be constructed that employs more than three LEDs. The limiting factors for the number of LEDs that can be practically used are the collimation of the light and the dichroic mirror efficiency over the specified range. Heavier multi-LED sources may be supported with our Ø1" or Ø1.5" Posts. The SM1A23 Zeiss Axioskop Microscope Adapter is shown. Mounted LEDs are available below. Please see the following tables for suggested compatible LED and dichroic filter combinations, or create your own by taking into account the transmission and reflection wavelength ranges of our Dichroic Filters. Lenses are mounted in the SM1V05 Lens Tube in front of each LED. For each lens, select an AR coating corresponding to the emission wavelength of the LED source. Two-LED source. This is the same as Example 1, but with the blue LED removed. The ray data files for the M455L3 can be used for the M470L3 as well by manually resetting the source wavelength in Zemax. Wavelength-specific data and files, such as the radiometric color spectrum and sample Zemax files, only apply to the M455L3. The ray data files for the M617L3 can be used for the M590L3 as well by manually resetting the source wavelength in Zemax. Wavelength-specific data and files, such as the radiometric color spectrum and sample Zemax files, only apply to the M617L3. 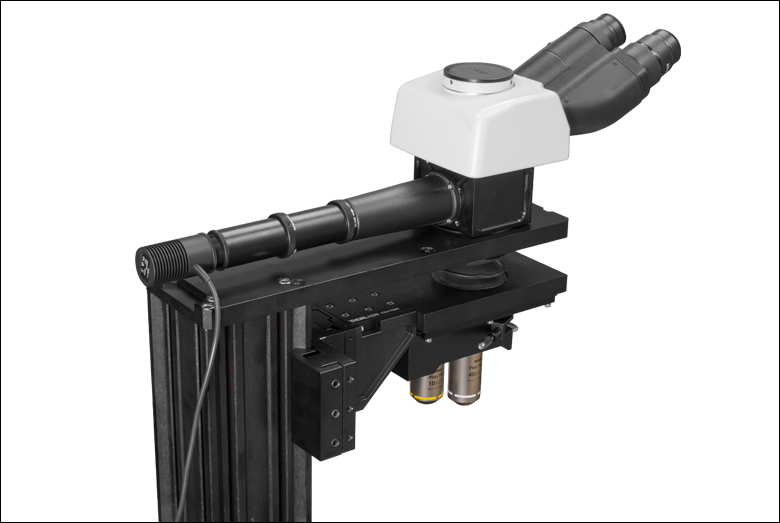 If you are interested in using a mounted LED with a Cerna modular microscopy system, the mounted LED can be attached by way of the single-cube epi-illuminator module (Item # WFA2001), which contains AR-coated optics optimized for the 350 - 700 nm wavelength range. 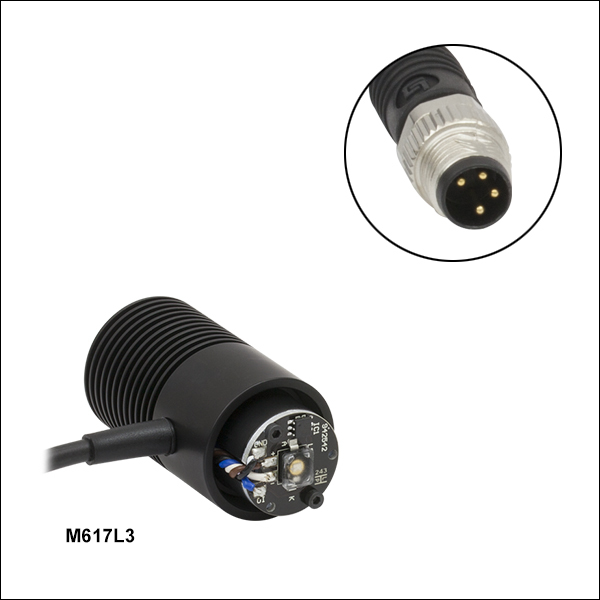 The mounted LED and epi-illuminator module are connected together by an externally threaded coupler (Item # SM1T10, provided with the WFA2001), which includes two knurled locking rings (Item # SM1NT, also provided with the WFA2001) that are tightened by hand. The mounted LED is then powered by a driver, sold separately. Please see the LED Drivers tab to identify the appropriate driver for your mounted LED. If you wish to connect multiple mounted LEDs to the epi-illuminator module, contact Technical Support. An exploded view of the mounted LED and its connection with the WFA2001 epi-illuminator module. Attaching the mounted LED is possible before or after connecting the epi-illuminator module to the microscope. The mounted LED and epi-illuminator module attached to the Cerna microscope. Please see the Overview tab to choose the appropriate color spectrum of mounted LED for your imaging needs. Again, note that the epi-illuminator module is optimized for 350 - 700 nm wavelength illumination sources. 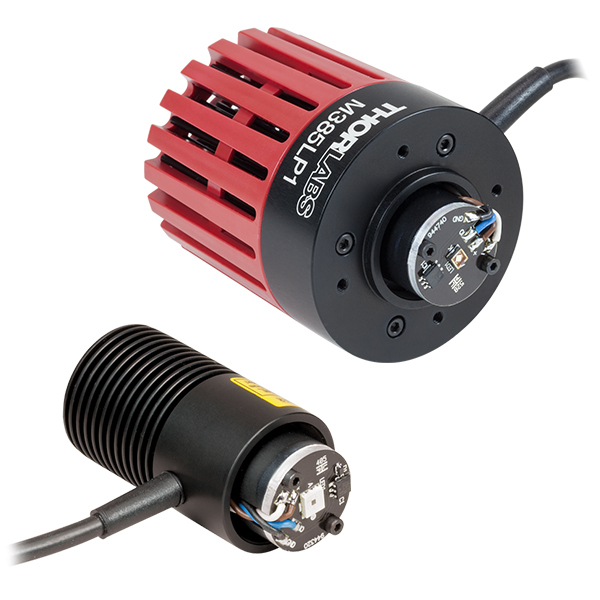 Certain mounted LEDs are also compatible with our illumination kits for trans-illumination. Please contact Technical Support if you wish to use an LED not currently offered as a component of these kits, as the collimating optics are optimized for certain beam characteristics. Hello- I need to time a camera trigger after turning on your LED, but I could not find and spec for LED rise time in yoru documentation on the web site. Could you please let me know how long a delay I need to place in my code between the time I turn on the LED and triggering to camera so I am insured the LED has obtained at least 90% brightness? Thank you for your assistance. This is a response from Nicola at Thorlabs. Thank you very much for your inquiry! We do not specify rise and fall times of LEDs, but typical values are in the ns range. The rise and fall times of LED systems are, however, limited by the driver electronics in most cases. Using one of our LED drivers leads to response times in the several µs range. Do you offer a variety of this the uses the ushio EDC940DS-1100-S5 or can a special version be made? This is a response from Wolfgang at Thorlabs. Thank you very much for your inquiry! 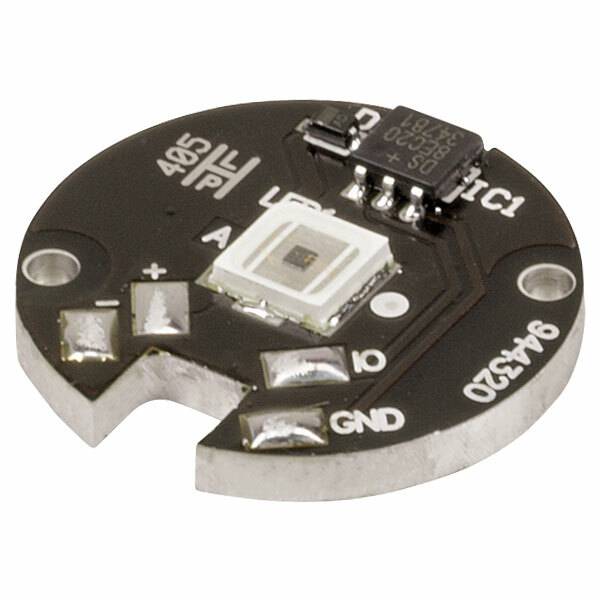 Unfortunately, we don't offer a mounted LED which uses this particular LED chip. I have however looked at the data sheet of this LED chip and the M940L3 seems to be quite similar in performance. I will contact you directly to discuss your requirements in detail. 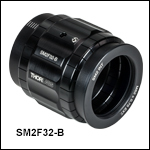 What is the approximative spot size of the collimated beam at 20-50 mm distance using the SM2F32 Adjustable Collimation Adapter? (LED = M940L3) Thank you! This is a response from Michael at Thorlabs. Thank you very much for your inquiry! I will perform a Zemax simulation with the M940L3 in combination with the adjustable collimator to determine the divergence angle and thus the resulting beam diameter at a distance of 20-50mm. I will send you the results directly. This is a response from Nicola at Thorlabs. Thank you for your inquiry! Unfortunately, we do not share the LED chip details of our mounted LEDs in general. Please contact your local Tech Support Team if you need specific information about the characteristics of the chip. Will a diffuse condenser lens have much effect on its collimation compared to a clear one? This is a response from Wolfgang at Thorlabs. Thank you very much for your inquiry! The quality of the collimation, i.e. the remaining divergence, will be roughly the same with or without a diffuser. The diffuser smoothens the intensity distribution of the beam and makes it more homogeneous. It will also smoothen the edge of the beam a bit so the beam would look a bit wider. The main disadvantage of a diffuser is that the transmitted power would be lower than without a diffuser due to absorption and reflection. This is a response from Nicola at Thorlabs. Thank you for your inquiry! The forward voltage of LEDD1B is high enough to drive M415LP1, but the maximum current is 1.2 A only, whereas the maximum drive current of the LED is 2 A. To reach the specified minimum output power of 1640 mW, you would need to apply a higher current than LEDD1B can provide. I therefore recommend using DC2200 as driver. Hello could you please send/share Zemax files for M625L3 and M730L4 LED sources? This is a response from Nicola at Thorlabs. Thank you for your inquiry! Unfortunately, we do not have Zemax files for these two LEDs. I will, however, send you ray files and an instruction on how to load them into Zemax. This is a response from Nicola at Thorlabs. Thank you for your inquiry. Unfortunately, we specify our LEDs by means of radiometric measures only. 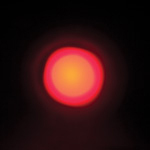 I will contact you directly to provide assistance for the conversion into photometric units. hello，I am going to buy a light source to use in my microscopic system.Here are my list: [M1300L3],[LEDD1B],[ACL2520U],[SM1RR],[SM1V05][SM1L03] Do they meet my needs? And I want to know the best distance between the LED and the lens. Thank you! This is a response from Sebastian at Thorlabs. Thank you for the inquiry. The selection look adequate for collimating the M1300L3. Basically the distance of the lens to the LED should be the back focal length. The best distance between LED and lens depends on the optical path in your microscope. I recommend to start with the back focal length and optimize the distance until you get best results. I contacted you directly for assistance. Hello, For the M850LP1 LED, which power supply product should be purchased? Thank you. Hello, thank you for contacting Thorlabs. 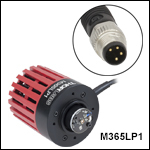 For M850LP1 we recommend to use DC2200 because only this device can drive the LED at its maximum current of 1.5 Ampere. 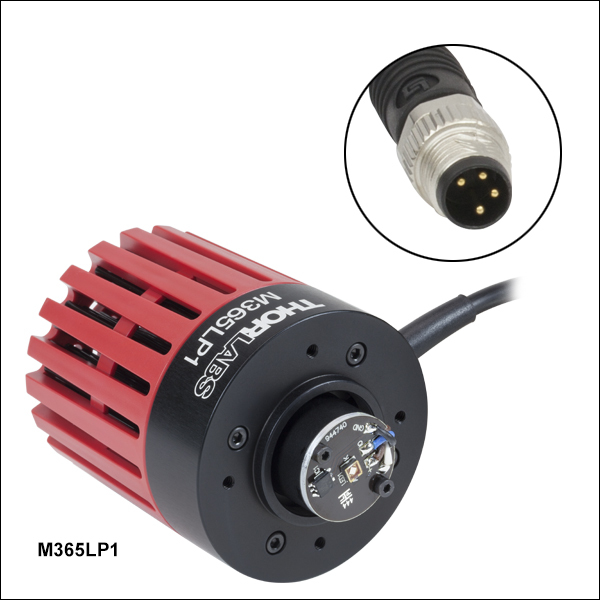 Other drivers (LEDD1B, DC4100, DC4104) would basically work with M850PL1 but with reduced optical output power. This is a response from Sebastian at Thorlabs. Thank you for the inquiry. The spatial coherence for LEDs is typically very small. We do not test the spatial- or temporal coherence for our LEDs so we can not provide specific data. I contacted you directly for further assistance. I would like to know what is the mode of operation of the MCWHLP1 LED using as a power supply LIU-PS LIU Series Power Supply. Is it a continuous wave (on all the time)? or is it a pulse modulation (on/off with time)? Thanks! This is a response from Sebastian at Thorlabs. Thank you for the inquiry. The LIU-PS is a voltage source and designed for our LIU-Series, which is a LED array light source (20 individual LEDs). LIU-PS will not work with our high-power LEDs. We recommend to use current sources like switching drivers (e.g. LEDD1B). I will contact you directly for further assistance. Hello. Is it possible to couple MNWHL4 to a multimode fiber or light guide? This is a response from Wolfgang at Thorlabs. Thank you very much for your inquiry! Yes, it is possible to couple this LED to a multimode fiber or a light guide. We don't have a ready-to-use product for this, but you can use Thorlabs' components for the coupling. I have contacted you directly to discuss your application and the necessary components in more detail. Hi, I see high frequency fluctuations on the flux output generated by the LED at 660nm. I use the M660 and the LEDD1B controller in continuous mode, below the maximum current (using the setting 1000 mA, to a rather high setting in this mode ~50 to 70% of the knob range). Fluctuations appear at the level of the kHz: we sample our signals at about 1.05 kHz, and observe sporadic drops (down to ~30% of the nominal value). Are you aware of a feature of the controller or the LED driver or of the LED electronics which would be related to this effect? This is a response from Wolfgang at Thorlabs. Thank you very much for your inquiry! The only expected fluctuation on the LEDD1B would be the ripple on its current which is specified to 8mA max. You use the LEDD1B at about 500-700mA so the ripple would be less than 1% of the current and couldn't account for the large drops in power you see. I will contact you directly to discuss this issue in further detail so we can find the reason for these power drops. does M365LP1 have a calibration report with NIST or PTB Traceability? This is a response from Wolfgang at Thorlabs. Thank you very much for your inquiry. These LEDs are tested during production to ensure that they work properly and that they emit the specified power. But unfortunately they cannot be calibrated. I have contacted you directly to discuss your requirements. Can you provide the switch off time for the MBB1L3 LED and could you also provide a clarification as to whether this LED uses phosphor to provide white light? This is a response from Sebastian at Thorlabs. Thank you for the inquiry. The MBB1L3 LED may not turn off completely when modulated at frequencies above 1 kHz with a duty cycle of 50%. For modulation at frequencies above 1 kHz, the duty cycle may be reduced. For example, 10 kHz modulation is attainable with a duty cycle of 5%. The broadband emission is luminescence generated by Phosphor. 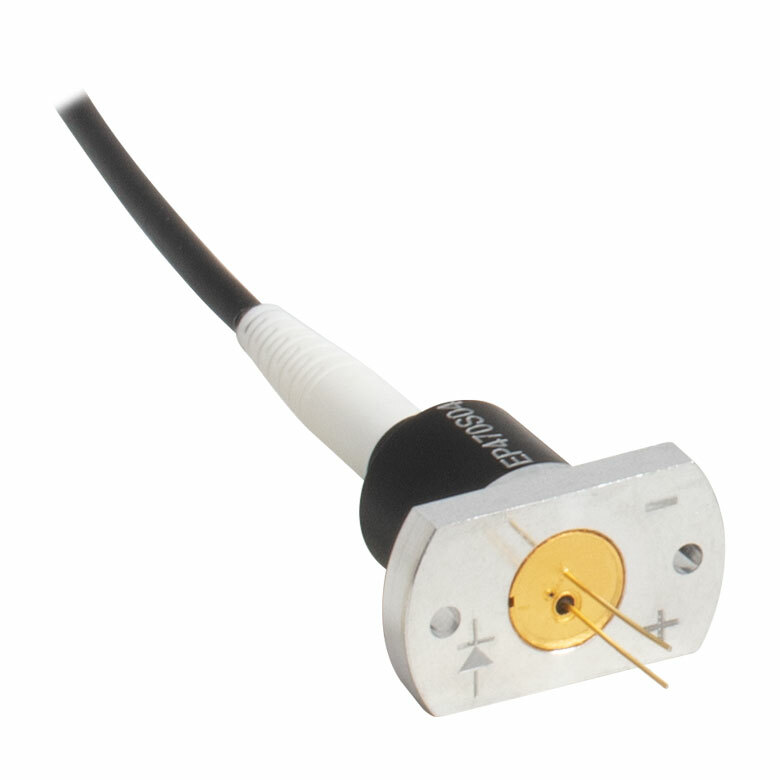 I want to use an LED as an excitation source on an olympus BX60 microscope. you sell the product for this, however it uses a 2" lens and when I look down the microscope illumination port it has a 25-30mm diameter restriction in it meaning most of the light from the LED would be blocked. So would it be better to use a 1" lens to collimate the LED as described below, rather than the product specified for the olympus microscope, and how would I fix this to the microscope, do you sell the olympus adapter without a lens? 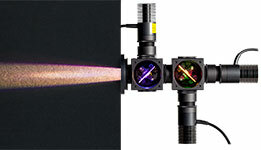 Response from Bweh at Thorlabs USA: Due to the large divergence angles of these LEDs, the 2" diameter lenses will collect more power than the 1" optic. For example, with a 60deg half angle divergence LED and a 20mm (or 12mm BFL) 1" lens, you will only be capturing about 56% of the LED output, which may or may not be suitable depending on your application. 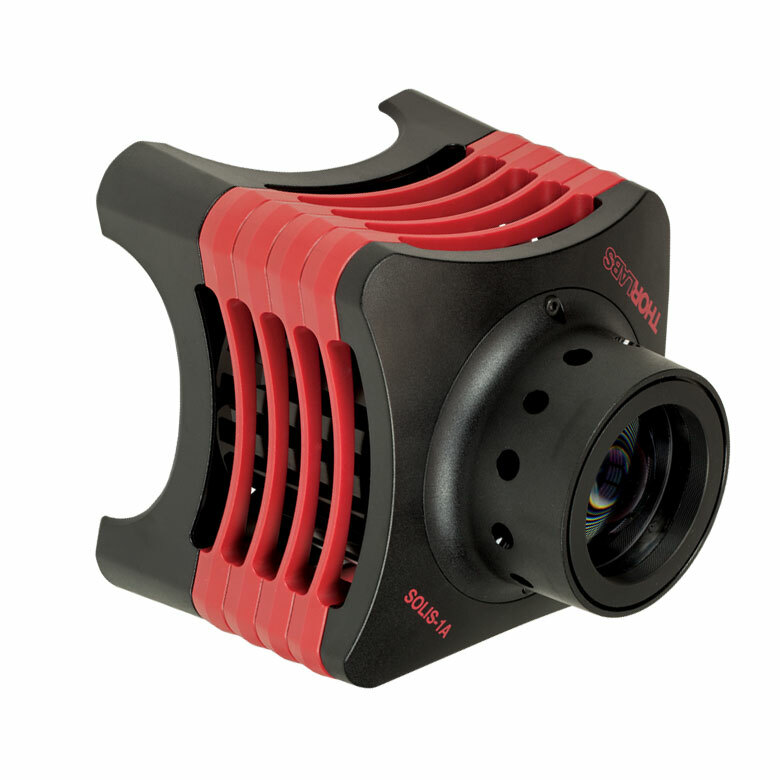 Should you need to use the 1" LED collimators, you would need an SM2T2 and we can provide the corresponding 2" adapter without the lens inside. Very pleased with your offering a 2" adjuster. Unfortunately, 3 out of 4 of the adjusters I am working with (ACP2520, SM2P50 and SM1P25) are hard to rotate. From my first observations, it seems it may be related to the environment conditions (temperature, humidity). 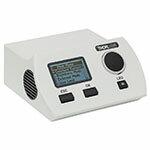 Would it be possible you provide your customers with the proper working environment conditions for the SM2P50 and SM1P25? Note that one SM1P25 doesn't have the problem at all, but the ACP2520 did (I modified it myself for smooth rotation), as well as the latest SM1P25 and SM2P50 I've received. I have contacted you and provided a detail report of my observations but only received a proposition from Thorlabs application engineer Yi-Ma to change the parts in question. This offer doesn't seem to address my question nor would it help if the replacements have the same issue. Response from Bweh at Thorlabs USA: Thanks for your feedback. We will check to see if we can replicate your observations regarding SM2P50 and SM1P25 performance under various humidity conditions. I will be in touch via email. Would it be possible to purchase the extra-thick SM1-threaded and SM2-threaded retaining rings for Aspheric condenser lenses separately? I use the 1" and 2" diameter aspheric condensers fairly often, and the regular retaining rings don't work well with them. This is a response from Stefan at Thorlabs. Thank you very much for your feedback. We have contacted you directly to offer you these retaining rings separately. This is a response from Stefan at Thorlabs. Thank you very much for your inquiry. I just tested this, the output power of the M625L3 without collimator attached measured with an integrating sphere was 840mW. The output power of the well collimated LED using the ACP2520-A was 430mW. The min/max power level measured with this collimator at its limit stops was 360mW and 640mW. I will contact you directly to discuss your application in detail. Response from Mike at Thorlabs: Thank you for your feedback. The thread depth is stated within our mechanical drawings (http://www.thorlabs.com/thorcat/MTN/M530L3-AutoCADPDF.pdf) which can be found by clicking on the red "docs" icons by the items numbers below. The thread depth for these LEDs is 6 mm. Based on this feedback we have added this information to the Overview tab of the web page. The SM1V10 can be used in place of the SM1V05 and SM1L03 pairing. However, the current recommendation allows for a slightly longer translation range of the optic due to the 7.6 mm depth of the internal threading in the SM1L03. The Collimation tab has also been updated to include the use of the SM1V10 as a collimation solution for these LEDs. This is a response from Stefan at Thorlabs. Thank you very much for your inquiry. On page 3 of the manufacturer’s spec sheet you can find a curve showing current vs. output power on a relative scale to 350mA . In this range you will see a linear relationship, however we have no information how this relationship changes in the range from 350mA to 700mA. We have tested this LED only at 700mA as this is the maximum drive current our heat sink system can also manage. 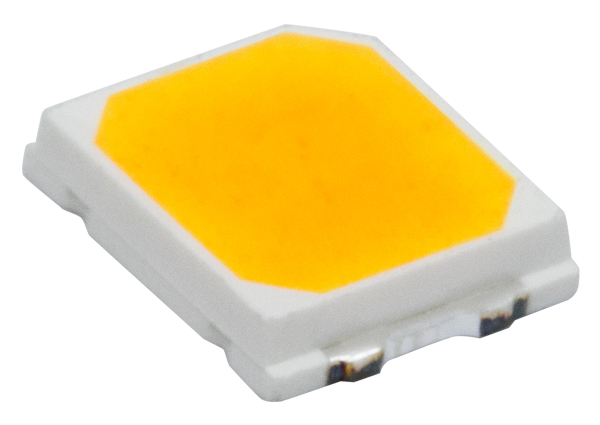 You can find the manufacturer spec sheet of this LED on our website here: http://www.thorlabs.com/thorcat/23300/M1050L2-MFGSpec.pdf Our spec sheet can be found here: http://www.thorlabs.com/thorcat/23300/M1050L2-SpecSheet.pdf In general information about this relationship if available, can be found in the manufactures spec sheet. I hope this information helps you further, please let me know if there is anything else you need. This is a response from Thomas at Thorlabs. Thank you very much for your inquiry. We will contact you directly with a quotation. This is a response from Thomas at Thorlabs. Thank you very much for your inquiry. We do have Zemax files available and i will contact you directly with more detailed information. This is a response from Thomas at Thorlabs. Thank you very much for your inquiry. Our Mounted High Power LEDs are all equipped with an EEPROM where the operating parameters are stored. The LED drivers DC2100, DC4100 and DC4104 read out the EEPORM and set the maximum operating current to the stored value. This way a current overload can be avoided. The driver LEDD1B is not able to read out the EEPROM and the current limit has to be set manually. The EEPROM will not cause noise to the current supply. I will contact you directly with more detailed information. A response form julien at Thorlabs: Than you for pointing this out. We corrected the presentation on our website so that now the wrench recommended is the SPW801. We will send you a replacement for the lens together with the new case. One other thing: On the application page where it explains how to collimate the LED, it says to use a SPW602 spanner wrench to secure the aspheric lens with one retaining ring on each side. I did this, and the SPW602 carved a circle on the front surface of the lens. Please change this text to instruct people to use a different spanner, so they don't inadvertently scratch their collimating lens. Hi: I have a minor issue to relay about the packaging of the mounted LEDs. I bought an M735L3 late last week and received it today. The plastic case it comes in is not well designed or built. Specifically, the red latch on front broke off while I was trying to figure out how to open the case. And it took two of the black plastic hinge-posts with it, so even when I put the latch back on the case, the case won't stay shut anymore. It seems silly to provide these in a hard shell case if the latch can't withstand a bit of force from a novice case-opener. 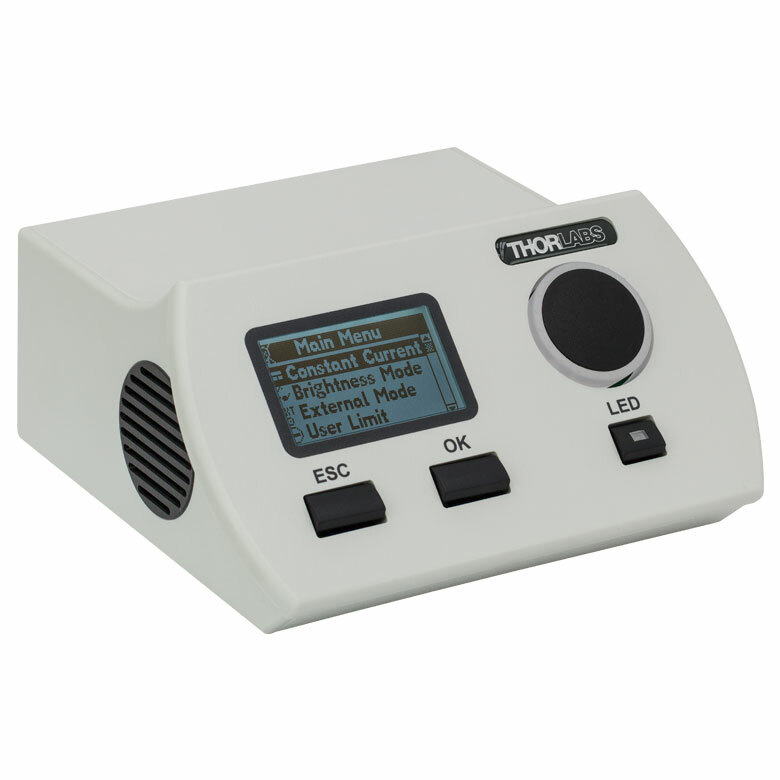 Response from Jeremy at Thorlabs: Is your power supply a voltage source or is it a current source? It is highly recommended that you drive these LEDs with a current source instead. If you used a 5V constant voltage source (@ 3A), then you will most likely be injecting 3A of current into this LED and thus destroyed it (max. current for MCWHL2 is 1.6A). Please note that the typical forward voltage for the MCWHL2 is only about 3.5V. It could also be that you have not connected this correctly. I will get in contact with you directly to check on the details on your setup. Response from Jeremy at Thorlabs: We do not have a precise number for this, but based on some old data, the rise and fall times are both on the order of 20ns or so. Hello Thorlabs. I am using the 385 nm LED and I need to know its on-off switching time, particularly its off time i.e. when you turn it off, what is the extinction time of the after glow. Even if this is not known precisely, as order of magnitude value would be very useful. A response from Julien at Thorlabs: Dear HongYang, thank you for your inquiry! The curve displayed on our website is aimed at showing the effect of long term thermal stabilization, ie. heat transfer from the LED chip and PCB to the heat sink. Should the thermal exchange channel be poor, it can be that the temperature of the LED will settle at a too high temperature, which would lead to the situation displayed by the curve "LED with poor thermal management". The time scale for this effect is indeed in the seconds range and the curve was plotted accordingly, which can give the impression that the rise time is slow. This rise time is however much shorter than visible on this curve and is typically of a few 10's nanoseconds. The main limitation in this case is the capacitance of the LED and thermal effects as plotted on the aforementioned curve will only be relevant at on a much longer time scale and much lower in magnitude than the capacitance related limitation of the rise time. The figure in the tab 'Stability' shows that the rise time of these LEDs is several seconds. So does it mean that LED cannot be fully charged when modulated at a high frequency? If so, that will introduce instability to the power in that situation, I suppose. Thanks a lot. Hongyang. A response from Julien at Thorlabs: Thank you for your inquiry! The radiation characteristics of the LED, which corresponds to the variation of the emitted intensity with the angular departure from the optical axis, is plotted for all our LED's in the mfg spec sheets. Those spec sheet can be downloaded by clicking on the red document icon next to the product number of the LED. Do you have information about the angle in which the light is emitted by the uncollimated mounted LED? Iam using the 455nm und the 850nm source. A response from Julien at Thorlabs: thank you for your inquiry! the 500mA that are specified by the manufacturer of the LED in the MFG spec sheet apply only for the bare LED. Due to the fact that the LED is mounted on a large heat sink and that the thermal coupling to it is very good, the LED can be used in constant mode at currents up to 700mA. A response from Julien at Thorlabs: Thank you for your inquiry. We can provide a Zemax model for the LED chip mounted in this LED. I will contact you directly to send you the information per email. Response from Tim at Thorlabs: Thank you for your feedback! We will look into providing this for you and will update you shortly. A response from Julien at Thorlabs: Thank you for your inquiry! The approach you intend to use is unfortunately only partially possible. The problem is that the voltage drops across the LEDs will add up when they are connected in series. The specified operating voltage for this LED is 6.8V. As the compliance voltage of the LEDD1B is typically 12V, you will be only able to connect a maximum of two LEDs in series, unless you reduce drastically the current. I will contact you directly to discuss your application and see which approach is the best suited for your application. I have four M505L1 mounted LEDs that I would like to connect in series with one LEDD1B. How should I wire them? Also, I've removed the wiring from three of the M505L1 mounts, but the LED is still attached. Response from Buki at Thorlabs: Thank you for your feedback. We will expand the information on our webpage. 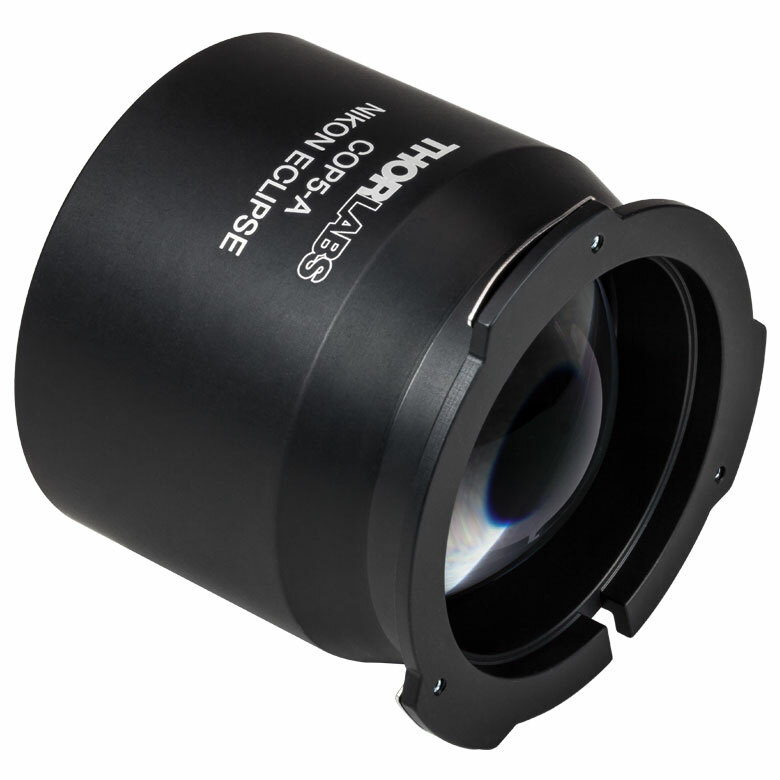 While we work on updating this page, please contact TechSupport@thorlabs.com for assistance in matching the catalog lens to the collimation adapter. First bullet on Collimation Adapter is "AR-Coated Aspheric Lens with Low f#" but i couldn't find the f# or NA, this would be nice to know. A link to the lens if it is a catalog lens would also help. Is there data available on the angular distribution of the output of these LEDs. Response from Javier at Thorlabs to dheidbrink: The length of the pins is 5 mm (+/-0.5mm). How long are the M8 leads on the mounted LEDs? Response from Javier at Thorlabs to last poster: Thank you very much for your feedback! We will embark on a project to provide the FWHM values for out mounted LEDs and will post the results on the web shortly. In the meantime, please contact us at techsupport@thorlabs.com if you have any further questions or comments. Response from Javier at Thorlabs to last poster: Thank you very much for your feedback. You are correct. A divergence of 3 degrees is a better practical assessment than my previously mentioned 1 degree, which is a best case, theoretical value. I apologize if this information was misleading. Please contact us at techsupport@thorlabs.com if you have any further questions or comments. *** Response from Javier at Thorlabs to skooi: Thank you very much for contacting us. The divergence of these mounted LEDs is in the order of 1 degree. The large, thick condenser used in this assembly generates a circular output beam, rather than a projection of the LED emitters. This has not been my experience at all. The divergence of our M660L2 is on the order of 3 and it is definitely imaging the LED, and not a uniform circular beam spot. it would be helpful if you would explicitly state the FWHM of the LED output. A response form Julien at Thorlabs: Dear Sewan, the use of another driver than the Thorlabs driver is of course possible. The simplest design is a DC current source. A pulse controlled approach is of course also possible. I will contact you directly in order to see what are the requirements of your experiment and what you had in mind for the LED control. Response from Javier at Thorlabs to skooi: Thank you very much for contacting us. The divergence of these mounted LEDs is in the order of 1 degree. The large, thick condenser used in this assembly generates a circular output beam, rather than a projection of the LED emitters. How collimated should we expect to be able to make the light out of these LEDs? If we purchase one of the collimation lenses, does the light collimate as a circular beam or just as the square shape of the LED? I would like to use the LCWHL2 white light LED with SM1 tube but what power supply can I use? I need maximum light flux, so the 1600mA are needed. I do not need to modulate the light. I have seen on your web site that previous driver going to 1200mW is obsolete but have not seen the new driver. What condenser lens would you recommend? I need it to fit in a SM1 tube. Response from Javier at Thorlabs to godina: we are discussing internally the development of a mounted 560 nm LED. I will contact you directly with more details. Are you guys coming out with an M560L2? (mounted LED, 560nm pure green? Hello, Im looking to mount this unit onto the condenser column of an Olympus IX71 (i.e. to use it as a replacement for a white light source). Can you suggest a mounting solution? Thank you. A response from Adam at Thorlabs to jrguest: The size of the LED on this device is 1x1mm^2. We will contact you directly so we can clarification on the optical invariant that you are looking for. What is the size of the LED or LEDs on the device? I would like to know the optical invariant of this source. A response from Adam at Thorlabs to Michael: It is possible to get an LED that outputs 385nm with a higher output power. I will contact you directly to get more information about your application. Would it be possible to get an M385L1 that outputs a similar power (or as close as possible) to the M405L1? Thanks. A response from Adam at Thorlabs to Michael: Thanks for the clarification. Just to clarify my previous statement, if you over drive the current beyond 1A, you will damage the LED beyond repair. A response to Adam at Thorlabs: Sorry, I actually meant 1A (silly typo). The LED is currently being run at a constant voltage of just under 5V, so it is the current that I am concerned with. Thanks for the reply. A response from Adam at Thorlabs to Michael: Typically LEDs are run at 5V or 12V. Using a voltage higher than 1V will not damage the LED if you can limit the amount of current reaching the device. LEDs are current run devices and will be damaged beyond repair if drive them with too much current. The M405L1 cannot be driven above 1000mA. Can you tell me the risks associated with over-driving the M405L1 LED above 1V? What are the likely consequences in terms of output power and potential damage and how far above 1V would you have to go? Thanks. A response from Ken at Thorlabs: Yes, these mounted LEDs are also plug and play compatible with the new DC2100. Is this series of mounted LEDs plug and play compatible with the DC2100 driver. I would like a product like the M850L1 LED source, but with longer wavelength. Something >900 and <1500nm. Response from Laurie at Thorlabs to atashtoush: To modulate the MBLED you will need the LEDD1 T-Cube LED driver and a TPS001 15 V power supply. You will need to provide your own signal generator with the following requirements: Minimum Strobe Pulse Width: 50 µs Strobe Turn-On / Turn-Off Time: <25 µs. The maximum flash rate obtainable with the LEDD1 with full 100% modulation will be around 3 kHz with a maximum strobe effect up to 10 kHz. If you need to modulate at higher rates you would need to consider a laser driver. Depending on the driver, you can indirectly modulate to about 250 kHz. Above that value you need to RF modulation directly into the LED anode. Each of these LEDs is mounted to the end of a large heat sink, capable of dissipating the large amount of heat emitted from the diode, that is covered by a Ø57.0 mm vented plastic housing. The heat sink is equipped with internal SM1 (1.035"-40) threads and four 4-40 tapped holes for compatibility with Thorlabs' SM1 lens tubes and 30 mm cage systems, respectively. Please note that these mounted LEDs with output wavelengths of 365 nm, 385 nm, or 405 nm radiate intense UV light during operation. Precautions must be taken to prevent looking directly at the UV light, and UV light protective glasses must be worn to avoid eye damage. Exposure of the skin and other body parts to the UV light should be avoided. These LEDs are not intended for use in household illumination applications. These LEDs are mounted to the end of a Ø30.5 mm heat sink for heat dissipation and thermal stability. 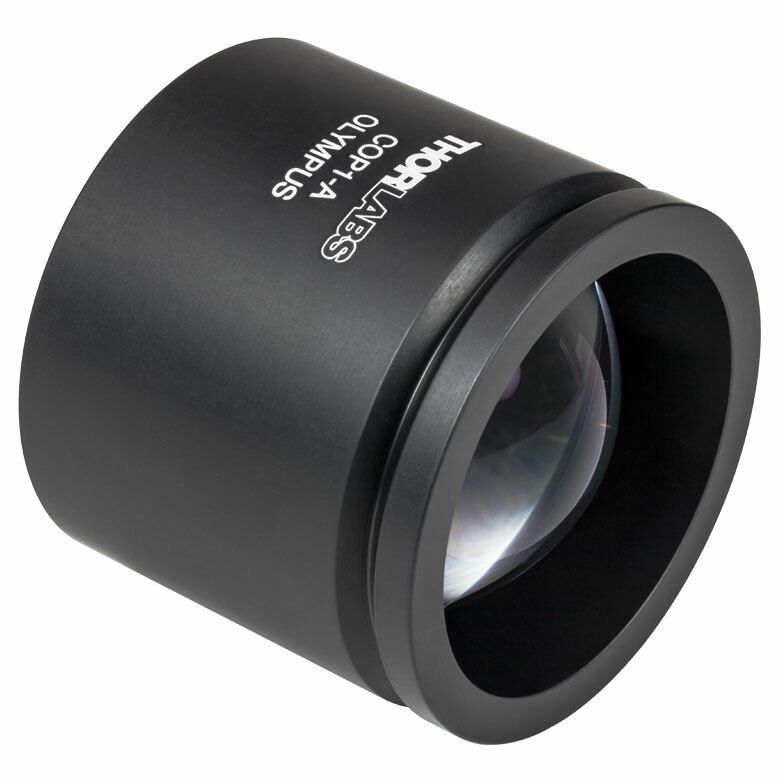 The heat sink is equipped with internal SM1 (1.035"-40) threads for compatibility with Thorlabs' SM1 lens tubes. Please note that our LEDs with wavelengths from 265 nm to 420 nm radiate intense UV light during operation. Precautions must be taken to prevent looking directly at the UV light, and UV light protective glasses must be worn to avoid eye damage. Exposure of the skin and other body parts to the UV light should be avoided. Mounted LEDs are not intended for use in household illumination applications. 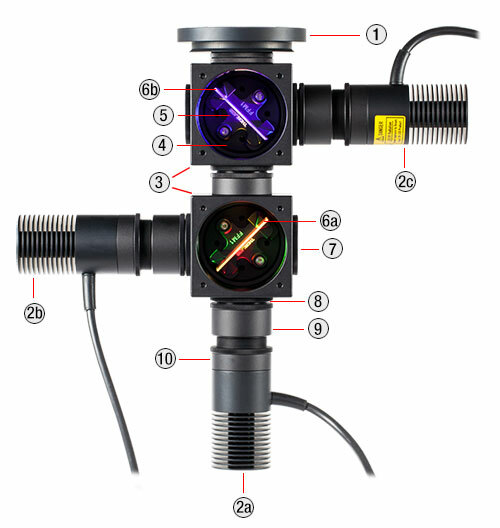 The adjustable collimation adapters include the SM1A2 thread adapter to enable integration with mounted LEDs, an aspheric condenser lens, a SM2 retaining ring, and a M62 x 0.75-to-SM2 thread adapter. These adapters allow a Ø2" (Ø50 mm) collimation optic to be integrated with the mounted LEDs sold above. The adapters can translate the lens by up to 20 mm. They are offered in versions without a collimation optic or with a removable AR-coated aspheric condenser lens for 350 - 700 nm or 650 - 1050 nm. All of these adapters attach to the LED housing via external SM1 threads, allowing them to be used with both the Ø30.5 mm and Ø57.0 mm housings. The collimation lens is mounted in an inner carriage that provides rotating translation along the Z-axis by turning the knurled adjustment ring (engraved with the Item # in the photos to the left) and is locked into position by turning the locking screw on the side of the adjustment ring with a 2 mm (5/64") hex key. Lines, spaced 2 mm apart, are engraved on the housing as a rough guide for how far the carriage has been translated. The mounting threads on the housing remain fixed during translation, allowing these adapters to be mounted between fixed lens tubes. These collimation adapters use an extra-thick SM2-threaded retaining ring designed for holding aspheric condenser lenses. The retaining rings can be tightened or loosened using an SPW604 spanner wrench. The input and output apertures of the collimation adapters are threaded for compatibility with various components; please see the table below for details. To insert or remove an optic in these collimation adapters, use the adjustment ring to translate the inner carriage to the output end of the housing. Remove the included retaining ring using the spanner wrench. If there is a lens installed already, remove it from the carriage. Insert another Ø2" (Ø50 mm) optic into the carriage, and use the retaining ring to secure it. Using a lens with a substrate or AR coating that does not transmit the wavelength of your LED is not recommended. Deep UV LEDs (wavelengths ≤ 340 nm) require a lens fabricated from UV Fused Silica, since many standard varieties of glass do not transmit below 350 nm. 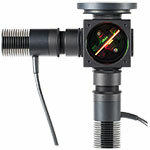 IR LEDs that emit at wavelengths ≥ 1050 nm can be collimated using an uncoated condenser lens, such as the Ø50 mm ACL50832U which has a wavelength range of 380 - 2100 nm. 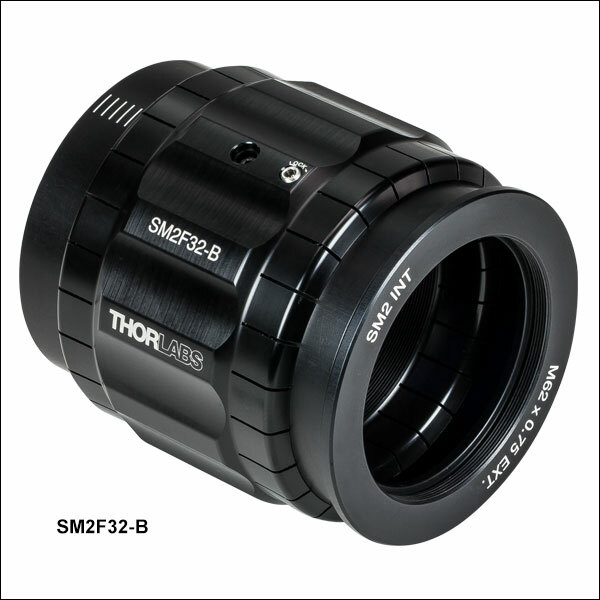 The SM2F does not include a collimation optic, allowing user-supplied optics to be integrated with Thorlabs' mounted LEDs. This thread is part of a removable adapter; removing the adapter reveals external SM2 (2.035"-40) threading. This thread is part of a removable adapter; removing the adapter reveals internal M62 x 0.75 threading. Installation of a collimation adapter to a mounted LED using the SM2T2 and SM1A2 thread adapters. The same setup can be used to attach the collimation adapter to the LEDs above that use a Ø57.0 mm housing. 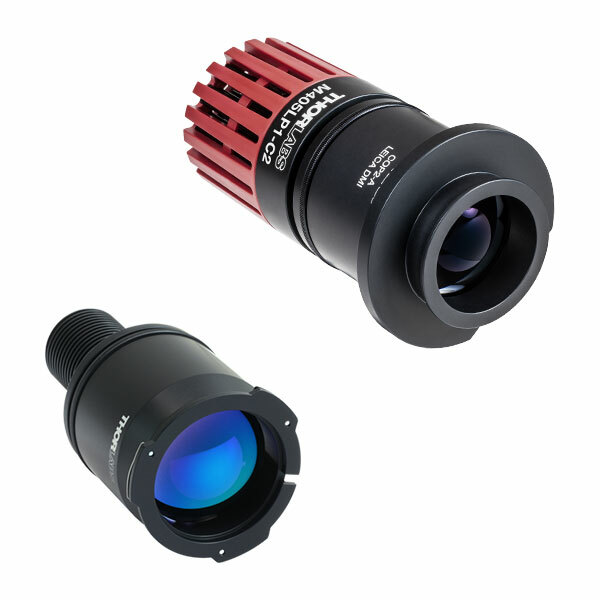 Thorlabs offers collimation adapters with Ø50 mm AR-coated aspheric condenser lenses (EFL: 40 mm) for collimating the output from the mounted LEDs sold above. 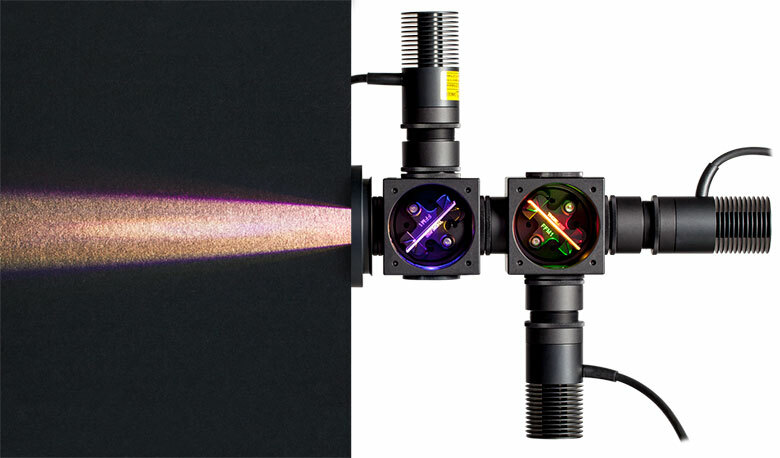 Two AR coating ranges (350 - 700 nm and 650 - 1050 nm) and four different collimator housings are available. Each housing is designed to mate to the illumination port on selected Olympus*, Leica, Nikon, or Zeiss microscopes. 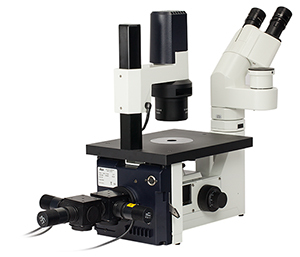 Compatible microscopes are listed in the Collimation Adapter Selection Guide table below. Using an adapter with a substrate or AR coating that does not transmit the wavelength of your LED is not recommended. Deep UV LEDs (M265L3, M285L5, M300L4, and M340L3) require a lens fabricated from UV Fused Silica, since many standard varieties of glass do not transmit below 350 nm. IR LEDs that emit beyond 1050 nm (M1200L3, M1300L3, M1450L3, M1550L3, and M1650L4) can be collimated using an uncoated condenser lens; the ACL5040U is an uncoated version of the Ø50 mm lenses used in the collimation packages below that has a wavelength range of 380 - 2100 nm. See the Collimation tab above for more information on collimation options. The LED sources described above can be fitted to the collimators by using an SM2T2 Coupler and SM1A2 Adapter (not included) as shown in the image at right. This assembly can be easily adapted to different LED sources by unscrewing the LED housing. *Please note that due to the optical design of the transmitted lamphouse port of the BX and IX microscopes, it may be necessary to purchase a separate adapter, which is available from Olympus. 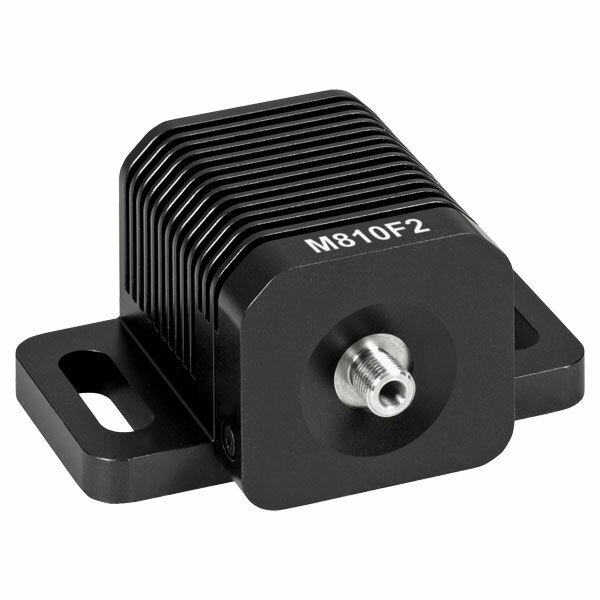 Please note that due to the optical design of the transmitted lamphouse port of the BX and IX microscopes it may be necessary to purchase a separate adapter which is available from Olympus. These adapters are compatible with any Zeiss microscopes that use the same dovetail as the Zeiss Axioskop or Examiner microscopes.